Every writer I know has had trouble making the statement “I am a writer.” I can say it now — after 30+ years spent writing — on most days. But I’m working on it. 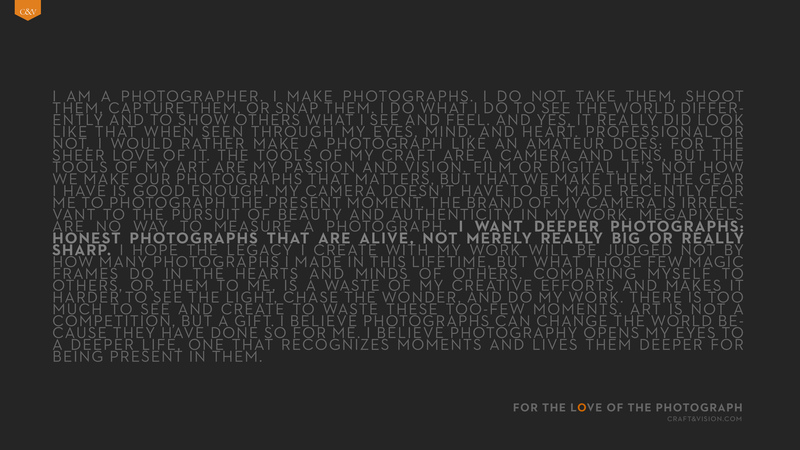 I’m reading so much on the subject of photography these days that I can’t remember how I came across the statement on this wallpaper. But I liked it so much that I resisted closing its tab on my computer. It spoke to me so strongly in part for what it says about the kind of photographer I want to be and for what it says about the kind of writer I hope I am. Do you consider yourself a writer? A photographer? What did it take for you to get to the point of being comfortable saying “I Am…”? Lovely post, Kathy, and your photo is beautiful. These are such good questions. I was talking about the same topic a couple of days ago with a friend who's a writer, and enjoys taking (or making) pictures. I find it easier to talk about how anyone who writes is a writer, or anyone who runs is a runner, than to talk about how my love of making photographs means I'm a photographer. But it wasn't always easy to call myself a writer (or a runner, for that matter). I had published a few books before I started to feel more comfortable with that term. Thank you for the link to that wallpaper. Making a photograph "for the sheer love of it" is very nice, and I like the parallel with writing for the love of it. Also, "The gear I have is good enough." I can see how it would be easy to get caught up in searching for the best camera and the right accessories. Nice to know you found this wallpaper statement appealing and though-provoking too, Sarah. Your remark about being a runner reminded me of an experience I had. I was having some sort of medical test done, and one of the staff, taking my blood pressure, asked, "Are you a runner?" I answered, "Well, um, I guess. I do run." But I'd never thought of myself as a runner before. That's lovely, what you've said here, Deb. Thank you. The best part of all is that you call me your friend. I didn't know you were a runner! Great point about external recognition. I wonder why so many of us have that feeling that we need to be paid for what we do in order to take ownership of a particular word. I don't feel I need to be paid for running, though–so why do I feel, as you do, that being paid for my photographs would make it easier to call myself a photographer? I admire your photographs and I'm certainly ready to think of you as a photographer. I'm going to try to start thinking of myself as one, too. See you in Joy's next class, I hope! Lots of hidden depths for you to discover yet, Sarah! I WAS a runner for six years. I ran 4-5k every other day, not matter the weather, no matter where I was, and sometimes did 8 on the weekend, occasionally as many as 12. I entered a few 5k races and twice did a 10k Terry Fox run. Since I'd never been an athlete it was exhilarating just to realize "I can do this!" Maybe how we THINK about our photography and approach it with artistic intent has as much to do with being a photographer as the act of taking or making photos does, or being paid to do so? Or maybe it's spending more time doing it than I'm managing to find, just yet. I'm glad you're finding this as interesting a question to ponder as I do. There's no doubt in my mind that you ARE a photographer. I didn't forget I'd been paid for the photographs accompanying my Reading Liberia story that appeared in a high school anthology. That is what you're referring to, right? I don't think if I'd been paid another time, I'd have forgotten! I did feel pretty good about that, in part because I put a value on my photos and secondly, because someone agreed to pay it. But I never felt totally convinced that it "counted" because the main reason the publisher bought the pics was because what was needed to illustrate the story simply wasn't available anywhere else. Ah, yes, Janet, so I did.